Saturday: Arrived and picked up hire car at airport. Drove to Hotel Excelsior Palace, which we booked through Citalia. It was hard to find the car park, all got a bit stressy. Narrow roads, pedestrian walk ways and lack of sign posts did not help. Our room had a view of Mount Etna. I wondered how far away it was compared to Pompeii and Mount Vesuvius. Sunday: Swam, walked in town, swam. The best bit of the hotel is the pool. 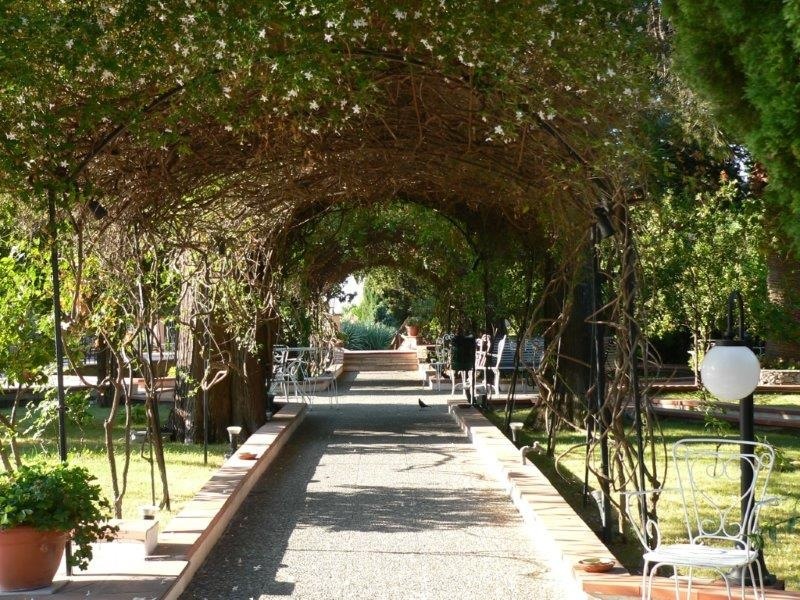 It is set in the gardens, so you walk down through orange and almond trees,along flower lined pathways, to the pool area. The pool overlooks the coast on one side and the cliff continues behind the hotel, so you can look up at the mountain tops on the other. Not entirely sure that two young boys and a large inflatable crocodile add very much to the atmosphere. Walked through the town with David. 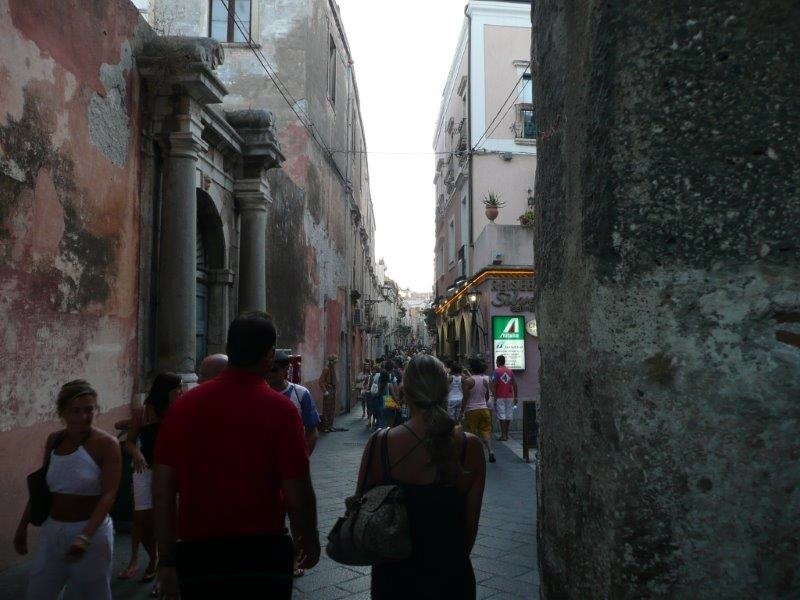 If you like very crowded walkways and lots of designer shops, you will love Taormina. Unfortunately, I hate shopping, especially for clothes, so it was rather wasted on me. Plus I got blisters from wearing pretty but uncomfortable shoes. Bought lunch in a supermarket and ate it in the garden. 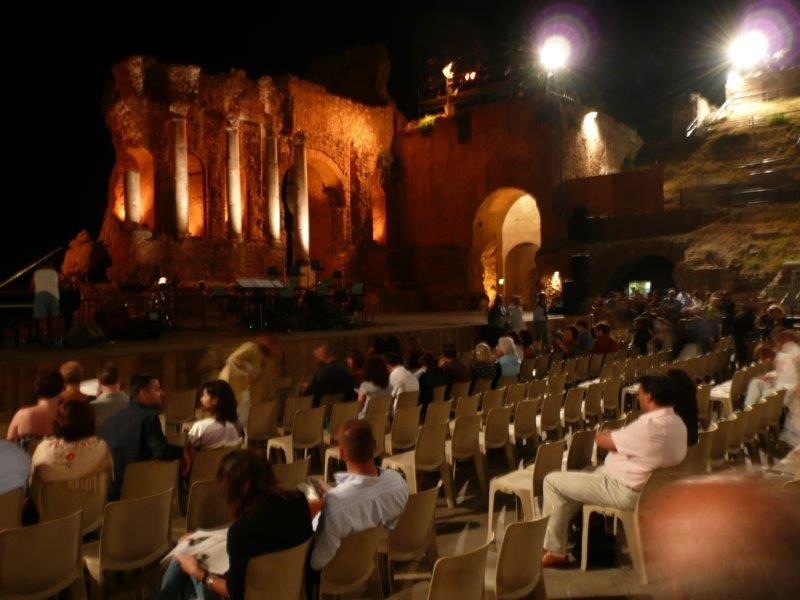 Jazz concert in a Greek theatre. We sat on chairs, listening to some really good jazz while watching the sun go down behind the Greek stage. 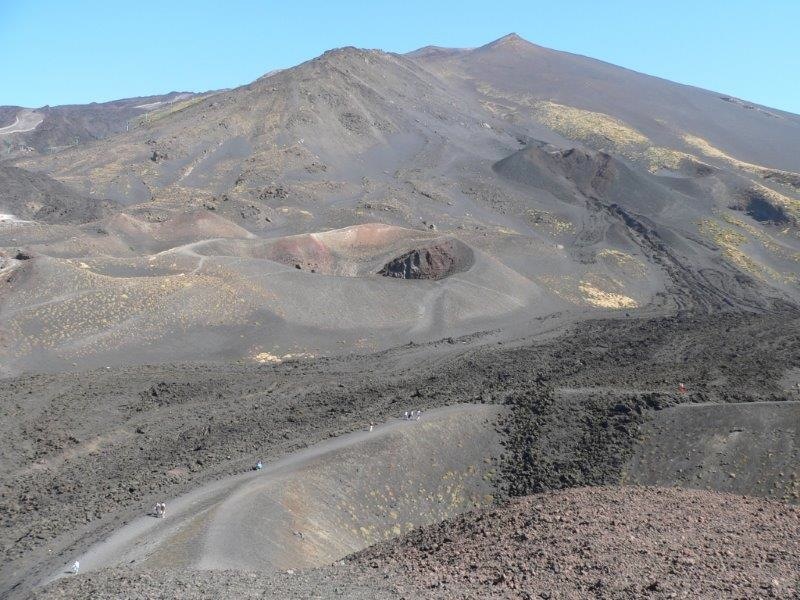 Wednesday: We decided to drive to Mount Etna. 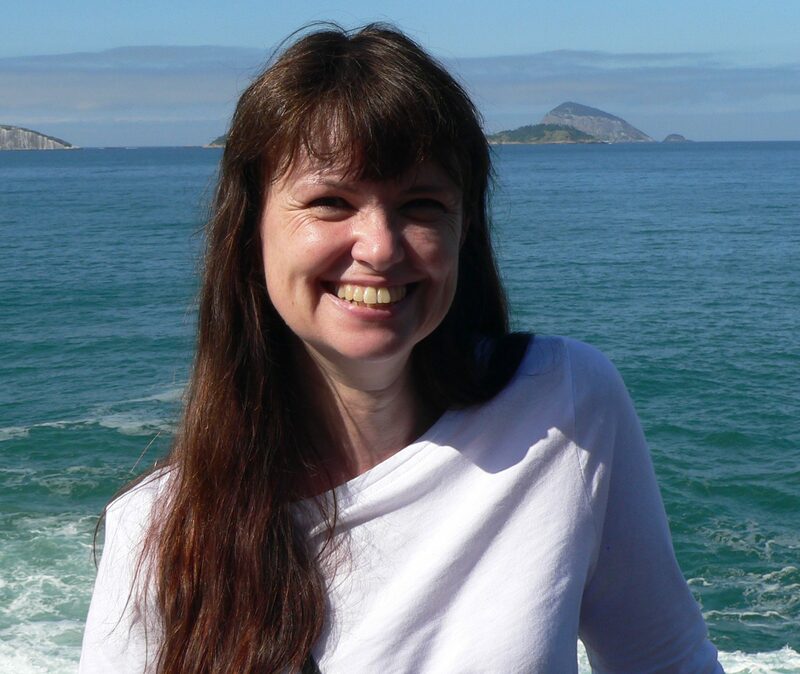 I was very excited, having never been close to a volcano before and having rather a passion for bonfires and burning things in general. However, the hire car gears jammed up on one of the many extremely steep roads. We waited in a very hot town (which had no public toilets) for a pick up truck and then a taxi to rescue us. It was hot and boring and uncomfortable. Had coffee in a square, which was nice. Evening meal was by the pool. The hotel had set up tables with lots of candles and flowers. It was so pretty. Thursday: We got the hotel mini bus down to the beach. This was a mistake. The hotel was up a cliff, so we couldn’t walk back. We were deposited at the beach and told the mini bus would return in five hours. The beach was full of beautiful people tanning themselves. The chairs were laid out practically next to each other, each with a small sunshade. Five hours is a long time. Even the sea was crowded! No way you could go for a run, build a sand castle or even swim properly. You just had to lie there, trying to read and sweating away while beautiful people strolled up and down elegantly between the loungers. 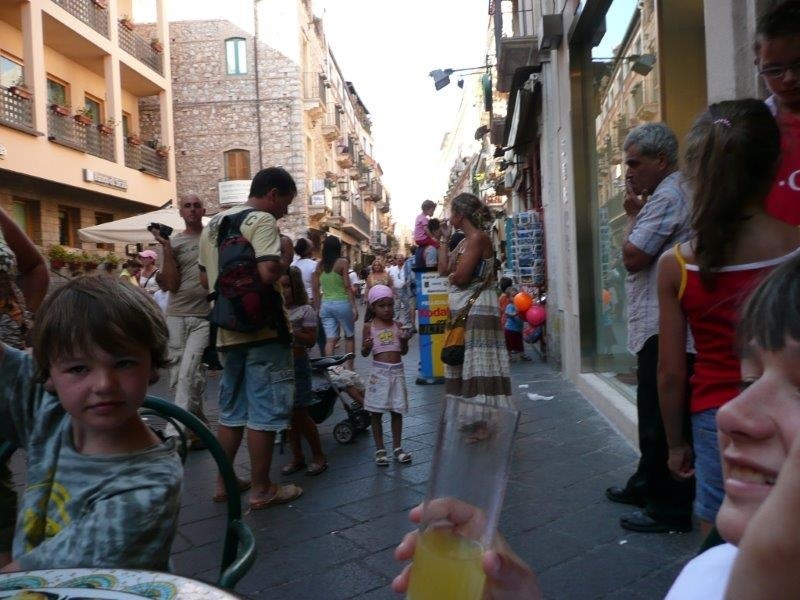 Returned to Taormina and bought ice creams. The new hire car was delivered. Walked through the town again. Friday: The boys slept through breakfast so David smuggled them hot chocolates. David was seen eating bread rolls. There was total silence, no birds or insects, nothing growing. Brilliant. Rebecca complained it was just a lot of black rock. We saw some geologists with all their equipment. Drove back early so we didn’t miss the car park. Parking was a pain. The hotel used the main car park in Taormina. There was often a queue to get in and it could be hard to find spaces. 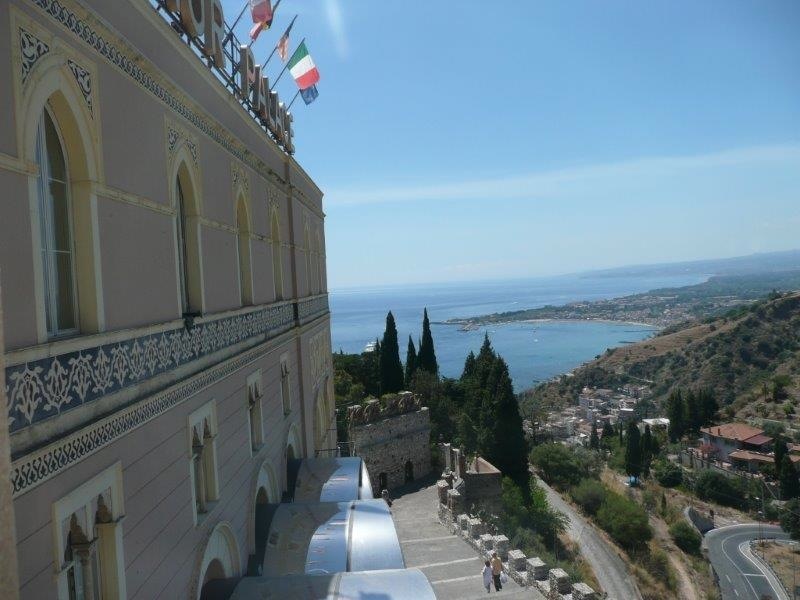 I wonder if it is possible to just hire a car for occasional days when actually in Taormina and not to bother actually having one for the whole holiday. It seemed more hassle than it was worth. Drank peach champagne cocktails and played cards in the bar. Saturday, Sunday, Monday: Days by the pool and strolling around town. Tuesday: Went on an excursion, booked through the hotel, to Stromboli. We were picked up and taken to a little port by coach. We then were taken by boat to a small island. The children swam and we wandered around for a while. 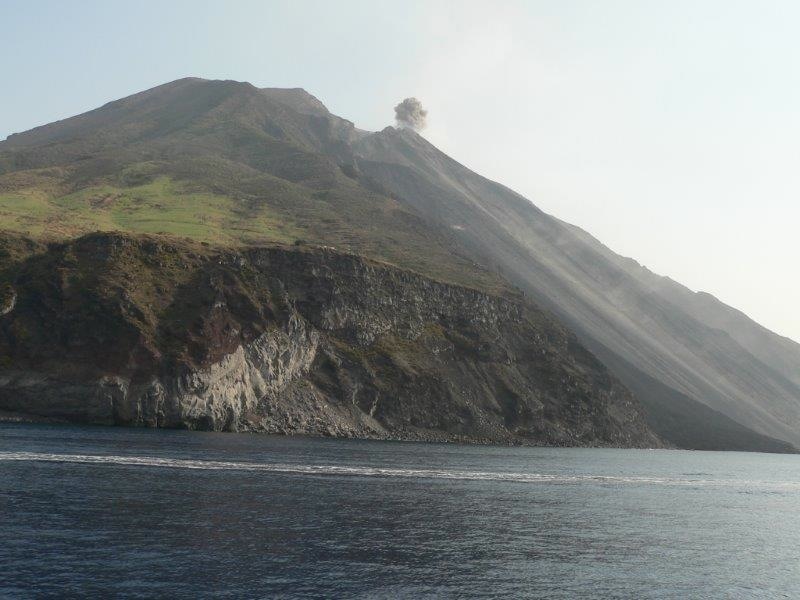 The boat then took us to Stromboli, which is an active volcano. About every twenty minutes, a plume of smoke could be seen coming from the top and flowing down the side, then steam as it hit the sea. We stopped on the island and could walk around the town. Had a drink and looked at the church. Then the boat took us around the island. We were given a simple pasta dinner. As it got dark, you could see sparks and fire in the smoke as the volcano erupted. Excellent! Wednesday to Friday: More time swimming and relaxing. We wandered around and found the roof of a building that had been completely engulfed by lava. It was so interesting. There was a clear line, one side everything was dead and covered in black lava, the other side, all was living vibrant forest. 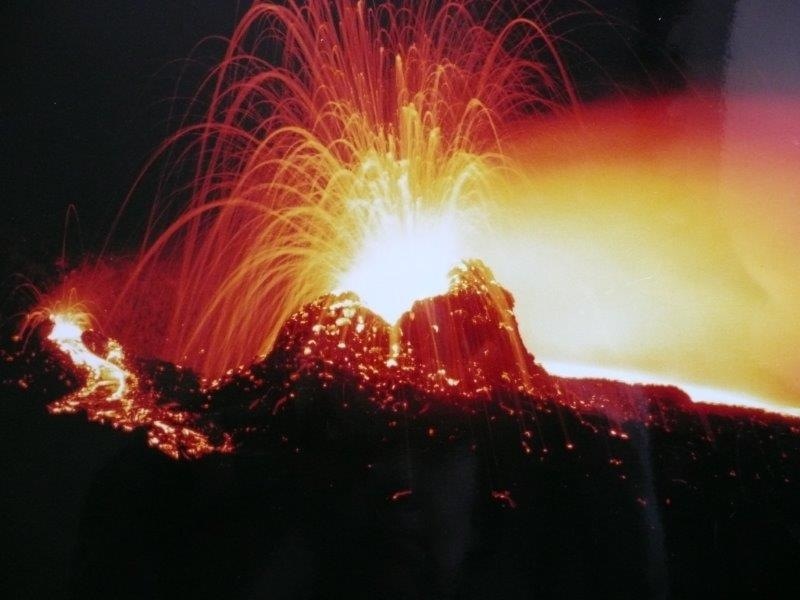 It must be so exciting to actually be there when it erupts, so much power and energy completely unrestrained. So much bigger than anything people do. I like things that remind me of how small I am. 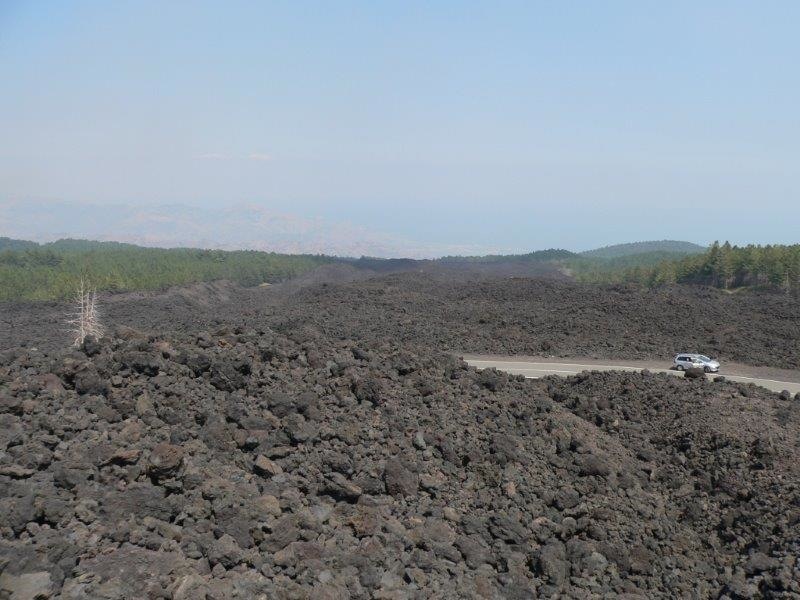 I would have spent more days at Etna, but even David declared he was at saturation point for black rocks. A brilliant holiday if you like either expensive shops or volcanoes. I realised I should have been a geologist. Bit late now.